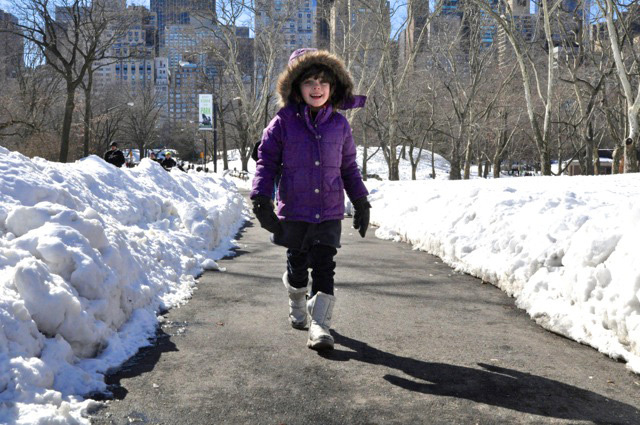 Busy and bold, New York City may not seem like the first choice for a family escape, but I found there to be an abundance of activities and intrigues for young explorers – particularly with the novelty of snow. During our visit, we discovered a world of fun and gastronomic adventure unique to the United States’ most iconic city. 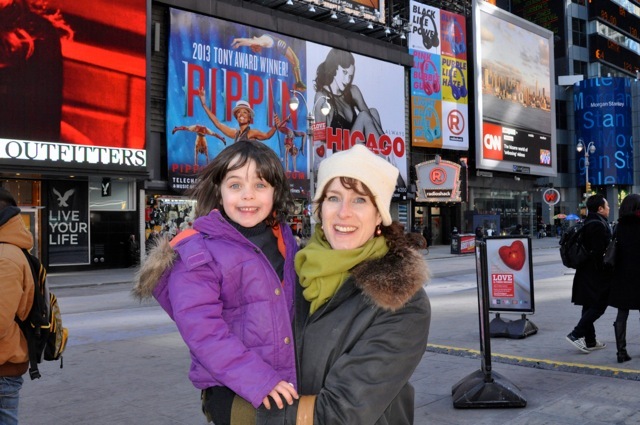 For February half-term we took our daughter to New York City – her first time in The Big Apple. It was an unqualified success (bar the ridiculously long wait to get through immigration) and proved to us that New York City is great for all ages, at any time of year. Our daughter was thrilled to be playing in real snow after such a mild UK winter. 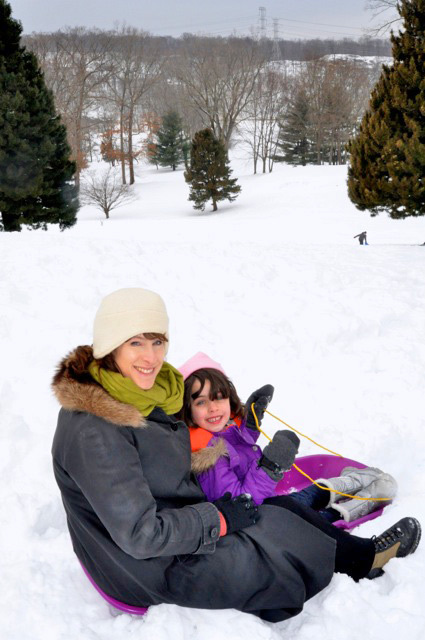 So we went to Prospect Park in Brooklyn and made a snowman, snow angels and threw snowballs. We also took her ice-skating in the new rink there – another first for Esme. She also tried sledging for the first time. The weather was by turns snowing or dazzlingly bright sunshine – off-setting the iconic buildings around Central Park to stunning effect. 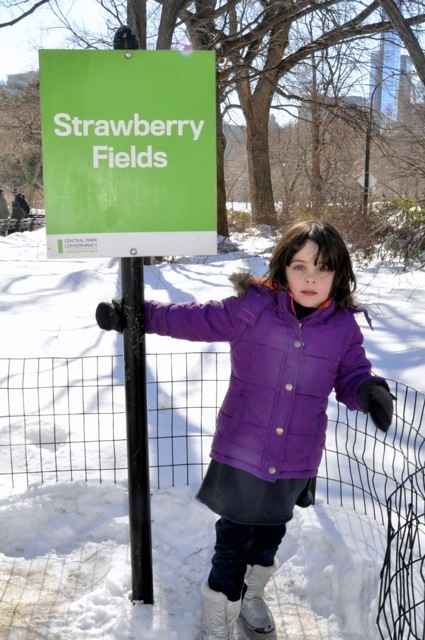 Here we waved at the tourist horses and carriages (which may soon be replaced by retro-style electric cars), slid on icy paths and visited Strawberry Fields to pay homage to John; The Beatles’ back catalogue is one my daughter knows well. 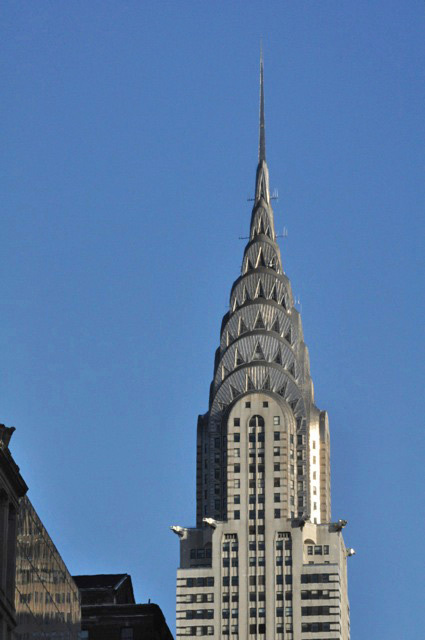 We stayed at Chambers Hotel in Midtown Manhattan, which is perfectly placed for the sights: just half a block from Fifth Avenue, a block from MoMA and 2 blocks from Central Park. It has stylish, comfortable rooms (with excellent minibars), and laid-back, funny reception staff. 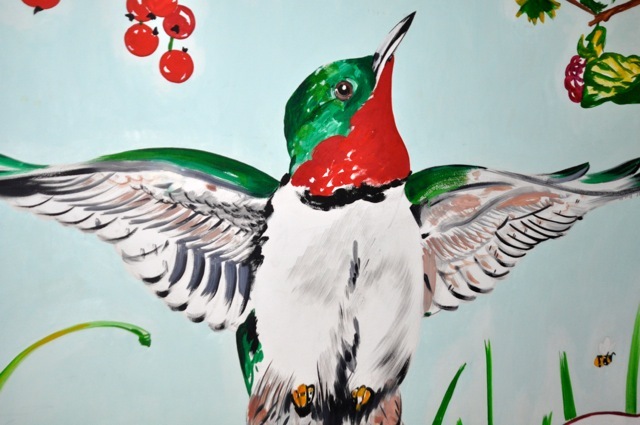 One of its most attractive features is the original artwork in each room and the commissioned pieces on each floor. We enjoyed riding the lift up and down to check out the different works and agreed that our floor – the 8th – had the best murals. On the ground floor, next to the breakfast room (where the bar is at night), they have a milk bar with cookies – another big hit with Esme. New York is a surprisingly kid-friendly destination. 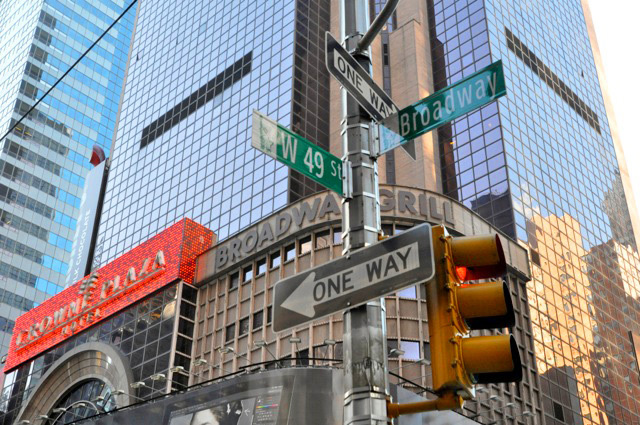 Esme was impressed by the glitz of Broadway – “Wicked! 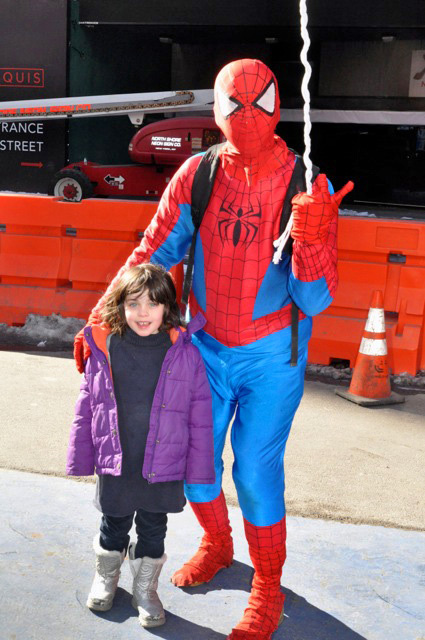 Matilda!” – and the excitement of Times Square, where she met Spiderman! 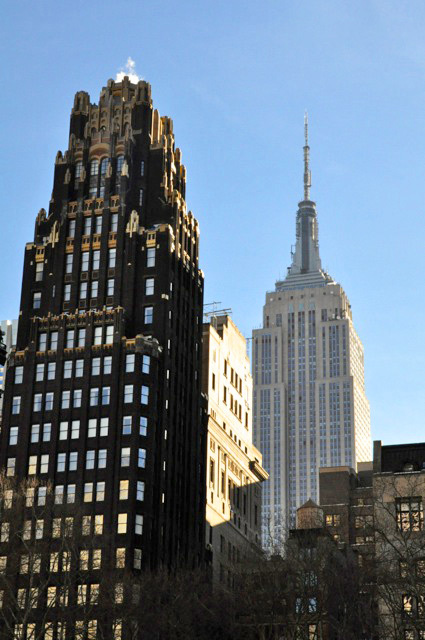 Quintessential New York behaviour such as travelling in yellow taxis and on the subway, and spotting the Empire State Building and the Chrysler Building, were all part of the package. And, she really dug the Egyptian collection at the Metropolitan Museum of Art. 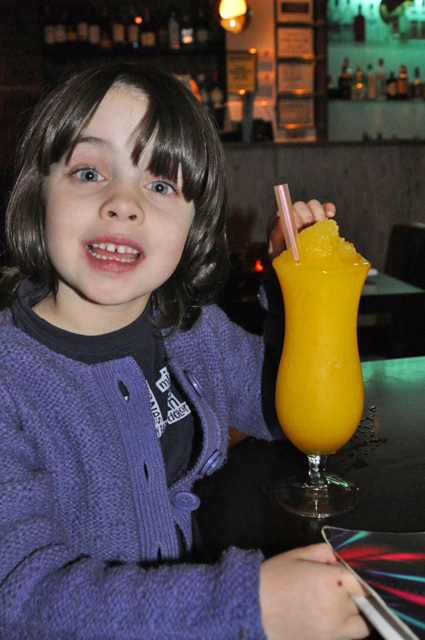 And the food is great for children! 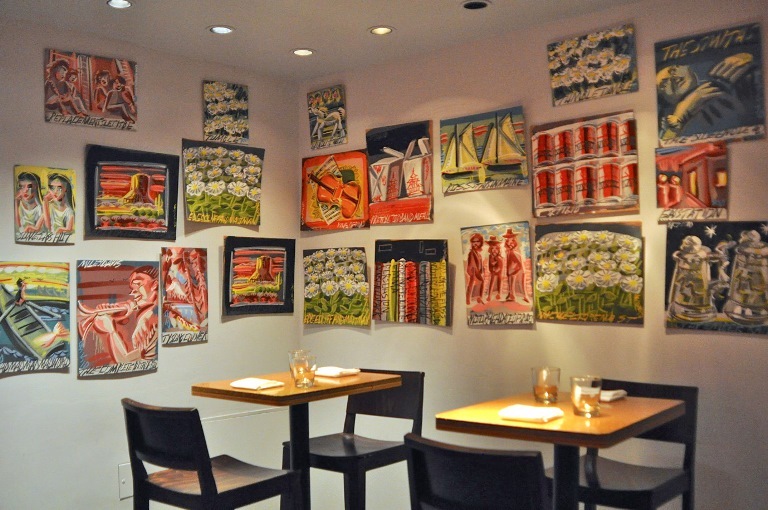 It’s amazing how adventurous they become while somewhere as cosmopolitan as New York City. We had pizza for one lunch, delicious Cuban pulled pork for another, gumbo one evening and, on our last night, Esme ate a full sushi meal for the first time- and loved it! 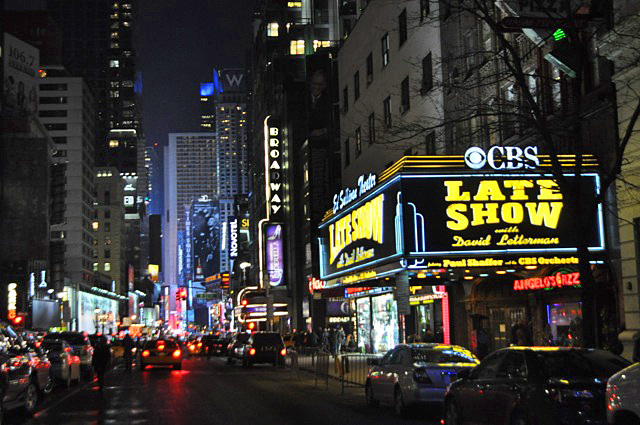 It was also on our last night that I had my ‘New York Moment’. We decided to walk back from the Japanese restaurant in Hell’s Kitchen rather than jumping in a cab, and took a small detour to see the lights of Times Square and Broadway. We were singing “Love is in the Air” and running through the streets together, the big city humming all around us.